Interview with Amy Berger, chatting about brain health, keto, her book, The Alzheimer’s Antidote, and so much more. One of the things I love most about a whole foods-based approach to keto is that it promotes healing all throughout the body, whether you need help with balancing hormones, increasing energy, eating more intuitively, and even promoting brain health! Don’t worry, this isn’t brain science … or at least it doesn’t feel like brain science! We’re talking about brain vitality, memory, dementia, Alzheimer’s, and how a ketogenic diet can be a great tool in pursuing better brain health. What I love about this episode is that Amy breaks down a ton of dense material into easily digestible, high-fat bites of knowledge so that we can have a much-needed conversation about the connection between insulin, glucose, and memory loss. In today’s podcast, we’re chatting about what you can do to help support your brain, including how to identify things that affect your brain health outside of diet. Today’s interview is with Amy Berger, who has made it her mission to help people reclaim their vitality through eating delicious foods. 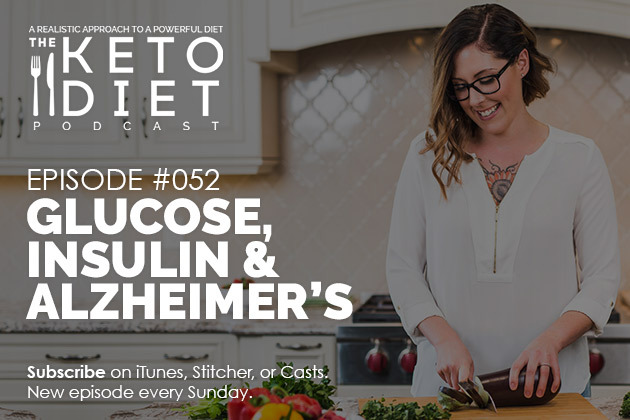 This episode is all about how to identify metabolic markers for brain health, the connection between insulin, glucose, and Alzheimer’s, and how to utilize a ketogenic diet to best support memory and cognition. My favorite MCT oil powder is from Perfect Keto, made of only 100% pure MCT oil from coconuts. Other MCT powders will add fillers like corn fiber, sunflower lecithin, maltodextrin and sodium caseinate to cut costs, all blood sugar-spiking ingredients which does anything BUT help us stay in ketosis. Use Perfect Keto coupon code HEALTHFUL at checkout for 15% off. 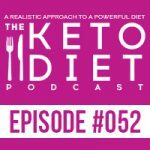 Leanne Vogel: You’re listening to Episode Number 52 of the Keto Diet Podcast. Today, we’re chatting about things that affect insulin sensitivity outside of diet, metabolic markers for brain health, the effect that a constant state of ketosis has on brain health, and so much more. So stay tuned. Hey guys, happy Sunday. The show notes and full transcript for today’s episode can be found at HealthfulPursuit.com/podcast/e52. The transcript is added to the post about three to five days following the initial air date of this episode. And let’s hear from one of our awesome partners. Guys, if you’re like me and you try a bottle of MCT oil and you pour just a little bit in your coffee, and all of a sudden, the MCT oil is not only all over your hands but also all over the blender and all over your cabinets, and you’re wondering what the heck happened? Or if you’ve tried MCT oil in the past and then you have a disaster pants situation and you’re running to the bathroom at work which is so, so embarrassing, I’ve got a perfect solution for you and it is called MCT oil powder. You just add it to your drink, it becomes all creamy and delicious, it doesn’t make a mess and better yet, you’re not running to the bathroom every time you use it. It’s a super simple hack but one that I promise is going to absolutely revolutionize your relationship to MCTs. Many people who’ve given up on MCT oil aren’t even aware that another option exists. But not all MCT oil powders are created equal. My personal favorite is MCT oil powder from Perfect Keto made of only 100% pure MCT oil from coconuts. All other MCT powders will add fillers like corn fiber, sunflower lecithin, maltodextrin, and sodium caseinate to cut costs, and all of these things are blood sugar-spiking ingredients which does anything but help us stay in ketosis. 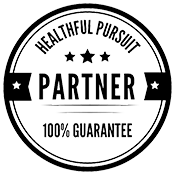 Use the coupon code HEALTHFUL, all in caps, for 15% off Perfect Keto MCT oil powder at Healthfulpursuit.com/MCT. Unsure of the link? Simply checkout the show notes of today’s episode to get all of the details. I got three exciting announcements today and they’re awesome. The first one is that the podcast is turning one this week. Our first episode of the Keto Diet Podcast premiered on October 1st, 2016 and since then, we’ve covered so many awesome topics with so many amazing guests from all things keto to all things fasting, regulating your hormones, to detoxifying and healing, building a healthy relationship with yourself and food, to following through on your goals, carb ups, to fat fear, and so much more. What a year, right? So how should we celebrate? I think we should definitely do a giveaway. So our second announcement is that we are doing a mega giveaway with some of our favorite brands. This includes Perfect Keto and Thrive Market. When you review the podcast, all you got to do is go to iTunes, leave a review, leave a star rating, be honest, and then email info@ketodietpodcast.com with a screenshot of your review and you’ll be entered to win one of our two prize packs. The first one is from Perfect Keto. The prize pack includes one Perfect Keto Base Chocolate Sea Salt, and that’s your exogenous ketones, and one MCT oil powder container as well as one Keto Collagen. The giveaway is open to US and Canada. The second prize pack is from Thrive Market, which will provide you with a one-year membership and a starter kit of your choice. Now, the starter kit has to be less than $50 but there are a lot to choose from and I think you’re going to love it. So when you leave a review for the podcast or if you already have, go ahead and take a screenshot of that, send us an email, we’ll enter you to win, and the winner will be randomly drawn on October 10th and we will contact you and once we’ve confirmed all of your information, we will announce the winners on Instagram live. We will choose two winners randomly, it’s going to be exciting. The third announcement is that we have some awesome exciting things happening. I have spent the summer sadly not relaxing, I don’t know if I have the ability to relax, I don’t think I do. I spent the entire summer working on something really awesome and I think you’re going to love it. That’s going to be coming out pretty soon. Again, thank you so, so much for listening to the podcast. None of this stuff would be happening if it weren’t for you and I really appreciate you taking the time out of your day to sit with me and learn about keto things and also telling me what we should put on the show, so I really, really appreciate it. Our guest today, her name is Amy Berger, MS, CNS, NTP and is a USAF veteran, certified nutrition specialist and nutritional therapy practitioner who specializes in using low carbohydrate nutrition to help people clean their vitality through eating delicious foods and showing them that getting and staying well doesn’t require starvation, deprivation, or living at the gym. Her motto is, “Real people need real food.” She blogs at TuitNutrition.com where she writes about a wide range of health and nutrition-related topics such as insulin, metabolism, weight loss, thyroid function, and so much more. She’s the author of the book The Alzheimer’s Antidote: Using a Low‑Carb, High‑Fat Diet to Fight Alzheimer’s Disease, Memory Loss, and Cognitive Decline. We covered a lot of ground today, all about dementia, Alzheimer’s, and a bunch of different brain health things. So without further ado, let’s cut over to this interview. Hey, Amy. How’s it going today? Amy Berger: Hey, I’m good. How are you? Leanne Vogel: I’m fabulous. I’m great. For listeners that may not be familiar with your work, why don’t we start off by you telling us a little bit about you? Amy Berger: Okay. Well, I am a lowcarb and keto/a little bit of Paleo-oriented nutritionist and I am also a writer, probably most of my work is writing within the nutrition and health world. I got into this like a lot of us do. I tried to help myself and I tried to help myself by doing the things I thought would help like a low fat diet, lots and lots of exercise, I’ve run a couple of marathons, and the weight just did not budge. No matter how hard I worked, no matter what I did, the weight wouldn’t budge, and I got tired of looking at friends who ate terribly and never exercised and looked better than I did. I stumbled upon the Atkins book several years ago and I never looked back. It made sense as to why and how lowering the carbohydrate in your diet can work and it explained why nothing I had tried before had worked. I had always eaten a lot of carbohydrates. My place in all this started with weight loss but of course over the years, I’ve expanded my interest in this. This way of eating is effective for so many things; weight loss is actually one of the least impressive things that it does, I think, and yeah, now I just try to share what I’ve learned with other people. Leanne Vogel: That’s exciting. At what point did you shift from being very weight loss-focused to being … whoa, actually there’s a lot of health benefits to this as well? Amy Berger: That’s a good question. It’s been a couple of years for sure already. I started eating this way … I don’t even know when it was, it was a long time ago. I think it’s hard to say when it morphed. I don’t know. It did take a couple of years. At first, it was really just my own personal interest doing this as, not even as a hobby, it was just really to lose weight. Then as I started reading more and more books and even early on looking at some of the scientific papers, the ones that I could understand anyway, and reading of course Gary Taubes’ book Good Calories, Bad Calories was real eye opener for me probably back in around 2008, when I already knew that this diet was very good for weight loss and a couple of others, obviously diabetes and stuff like that. But then to learn that there’s a role for this in heart disease and arthritis and like my book Alzheimer’s, there’s so many things. Weight loss is just such a tiny, tiny piece of what this is capable of. Leanne Vogel: How did you hone in on Alzheimer’s and why has that been so important to you and your work? When I started looking, Leanne, I almost fell over, like fell out of my chair. I couldn’t believe how much research there was on this. It was literally hiding in plain sight, like they say. It’s everywhere. You can’t look for information on Alzheimer’s and not come across this connection. It was shocking to me that nobody was talking about it and this was potentially life-saving, life-changing information. It was all over the medical journals, it was all over the research, but nobody was telling the patients, nobody was telling the caregivers, nobody was telling the people that needed this the most. That’s pretty much why I wrote my book, basically as a way to bring this really, really important information and these findings to the people that need them and to actually implement them in their lives. Leanne Vogel: Yeah, that’s huge. I had a grandfather that had Alzheimer’s and just thinking back to all the food that they fed him and the candies he had in his room. We do the Alzheimer’s run every year just to support that and a lot of money is raised and when we sit down for meals after the Alzheimer’s run, it’s filled with carbohydrates to the point where there are no keto options. Usually, there’s keto options, you can kinda piece things together. But at the Alzheimer’s run, there is not and it just blows me away. Amy Berger: It’s terrible and it’s the same thing as like when they have bake sales to raise money for Type 2 Diabetes, let’s have a cupcake sale. It’s ridiculous. I refuse to believe that the people eyeball deep in this, the people leading these fundraising organizations and even some of the medical organizations for Alzheimer’s, and I refuse to believe that they don’t know about the connection between insulin and glucose and Alzheimer’s. That they’re not at least aware of it. It’s really unfortunate. Alzheimer’s patients, especially if the disease progresses, they actually really, really crave sweets, even more than usual. I don’t know if you found out with your grandfather or not but I feel like there’s a reason they want to placate these people with sugar because it’s what they want. But it’s in my opinion and the research seems to suggest that it’s contributing directly to the pathology. Leanne Vogel: More of my interview with Amy Berger after this message from one of our podcast partners. Now you can shop all things Paleo Valley, load up your cart, and apply a sweet coupon code on everything in your cart. Take advantage of this offer by going to Paleovalley.com/keto20. Fill up your cart and enter the coupon code KETO20, that’s K-E-T-O-2-0 at checkout to apply a 20% off discount on your entire purchase. Unsure of the link? Simply check out the show notes of today’s episode to get all the details. Let’s go through a little bit because you’ve said it a couple times, the connection between glucose, insulin, and Alzheimer’s. Before we get going with keto and dementia and Alzheimer’s, could you mind just going through what that connection is and how that works? Amy Berger: Yeah. Alzheimer’s disease is regularly referred to all over the medical research as Type 3 Diabetes or diabetes of the brain, and that comes mainly from the issue that the Alzheimer’s brain has lost the ability to get enough energy from glucose. We’re not really sure exactly why that’s happening. There’s a lot of reasons why it could be happening but the bottom line is that’s the fundamental problem in this condition is the brain cells are almost like starving to death because they’ve lost the ability to use glucose for fuel. One of the biggest risk factors for this illness is chronic hyperinsulinemia, or insulin resistance, basically. There’s a reason Type 2 Diabetics have a much higher risk for it. There are some genetic factors that feed into it and other things but regardless of genetics, even regardless of family history, having chronically high insulin is a huge risk factor for Alzheimer’s disease. So there’s something going on with the brain being impaired in its ability to metabolize glucose, basically. Leanne Vogel: Which came first, the chicken or the egg? Is it because they eat a lot of carbohydrates that Alzheimer’s may be more prevalent or is it when they get Alzheimer’s, they crave more carbohydrates because their brain is thinking, “More carbs. Let’s try to make this work.” Do you know? Amy Berger: That’s the million-dollar question and I don’t even know that we have the answer to it. I don’t think they’ve done enough prospective studies with diet at least to say, “Okay, is it the people who eat the most carbohydrate who get more Alzheimer’s more often or is it something else,” because carbohydrate isn’t the only thing that affects insulin levels. Even dietary carbohydrate is not the only thing that affects blood sugar. Sleep feeds into it, stress levels feed into it. I think, based on what I’ve seen, that not necessarily a very high-carb intake per se but a high-carb intake along with maybe poor glucoregulation overall, whether that’s from not getting enough physical activity or being stressed out or not sleeping enough. And possibly, the combination of excess sugar with some of these vegetable oils that we’ve all been eating for all these years that are turning out to not be so good for us and possibly couple that with nutrient insufficiencies, things like B12, things like omega-3 fats. It’s the perfect storm. It’s this coming together of multiple things that I think are contributing to the loss of the ability of the brain to use glucose. I think a high carb, high sugar diet is probably the biggest factor but I think that alone is probably not enough to cause this. Leanne Vogel: I’m happy that you mentioned too the stress, sleep patterns, physical activity, those pieces that can also influence insulin quite significantly. Amy Berger: Exactly. All of those things affect insulin sensitivity, and I think that’s why those are all potential factors feeding into this. Leanne Vogel: Before we get into brain health and quantifying things, why don’t we chat a little about the treatment strategy that you’ve put in your book and tell a little bit about your book, too. Amy Berger: All right. Do you want to start anywhere in particular? Leanne Vogel: You just run with it. Leanne Vogel: What’s your book about and what’s the treatment strategy that you put in your book? Amy Berger: Okay. Well, I’m not a doctor so I hesitate to use the word treatment, but I call it a nutritional intervention. Leanne Vogel: I like it. Amy Berger: Yeah. We nutritionists, we have to be so careful with that. So being that, the fundamental problem in this condition is that their brain is not able to get enough energy from glucose and these neurons basically atrophy. You can see these on brain scans. You can actually see the volume of the brain shrinking as these cells start to shrivel up. I’m oversimplifying, but that’s basically what’s happening. Being that that’s the case, is there some work around? Is there some other fuel that maybe we could use to nourish these starving neurons? As you know, as some of your listeners probably now, ketones are an excellent fuel for the brain. The odd thing in Alzheimer’s is even though these cells are not able to use a lot of glucose, they can use ketones. They’ve shown this not only in animal models but in humans with Alzheimer’s disease. When you get these people’s ketone levels elevated, whether it’s via a ketogenic diet or with exogenous ketone supplements, when their ketone levels are higher, they do have improved cognition, they do have improved behavior. We know this works. Now, it’s not a slam dunk. I’m not saying this is like an overnight miracle cure for Alzheimer’s. It is not. But being that every single pharmaceutical drug developed for this condition has been a total failure, we’ve got to do something else because none of these drugs address the fundamental underlying problem of this metabolism. Alzheimer’s disease is a metabolic problem and by metabolic, I mean it has to do with energy. The reason I prefer the ketogenic diet over the supplements, and we can talk about why, but I prefer the diet because when you get someone’s ketone levels elevated by the exogenous ketones, it’s very short-lived. Those things have a half-life, I think, of about an hour and a half and then they start to go away. But if you have somebody on a diet where they’re producing ketones themselves 24/7, even at a low level, that’s giving you a much better baseline to start with that. That brain is getting nourished, is getting fueled all the time. There’s a lot of other things to do. Like I mentioned earlier, B12 deficiency is rampant in not only in the elderly, in the whole population, but in older people especially. So there’s certain specific foods that I recommend to be a part of the diet but the main, most powerful intervention I think you can do is to give these starving brain cells an alternate fuel. Not only that, I think the beauty of a ketogenic approach for Alzheimer’s is not only do ketone serve as an alternate fuel for these cells but in reducing the total insulin load, the total carbohydrate load, we help re-sensitize the brain to the insulin and glucose that’s already there. They did a rat study, I don’t know if they replicated this in humans but they’ve shown in rats that rats with the model of Alzheimer’s disease, when their ketone levels are elevated, not only does the brain take up ketones very well, the uptake of glucose is better than rats with Alzheimer’s not on a ketogenic diet. It’s almost as if like not only does the brain take up the ketones, but it also takes up glucose better so it’s like a win-win. There’s a lot of other things that can improve the cognitive function, that can improve the nutritional status but that to me is the single most important place to start. For somebody listening out there who has a loved one with this disease or who’s a caregiver, if this is the first time you’re hearing this, if you’ve never heard of Type 3 Diabetes, you’ve never been recommended to have your loved one’s insulin level checked or their B12 levels checked, that is a tragedy. Shame on the neurologist, shame on the doctor. I shouldn’t have had to write this book, a doctor should’ve beaten me to this. I wrote this because this book didn’t exist yet and it needed to. Mary Newport is a physician who wrote a book about her husband, Steve who had dementia, but I think not a lot of people knew about it. I just think this is staring us in the face and nobody’s bringing it to the people that need it. Now based on your research and what you found out there, do you think that a ketogenic diet could reverse Alzheimer’s or are you just saying that it more like pauses it or what’s your thought on that? Amy Berger: That’s a really good question. I think it can go very far toward slowing the progression, potentially halting the progression. I think there might be some degree of reversal possible. I think if somebody’s in a very late stage as if someone is very advanced dementia or is very elderly, I wouldn’t expect much of a turnaround. I think obviously, the younger somebody is, the more mild the disease, the more I would expect that person to actually recover rather than just making the decline more slow. There’s a doctor out there, Dale Bredesen, he’s also coming out with a book right about now. We’re recording at the end of August. I think today might actually be his release date. He’s done some very small trials where they have reversed it. They have reversed dementia. Well, they reversed mild cognitive impairment which is the precursor and they’ve reversed early sort of mild, early Alzheimer’s. They measured on the brain scan like I was mentioning earlier that you can see the shrinkage of the brain. They have actually restored people’s brain volume. It’s amazing. His program is not even a ketogenic diet. It’s a multifactorial intervention. His diet is more of a Mediterranean, slightly higher fat, lower carb, but definitely not ketogenic. But I think obviously, the earlier this is caught, the more likely it is that we can reverse it. I do think some degree of reversal is possible but like I said, I wouldn’t expect a miraculous turnaround in somebody very old but the thing with Alzheimer’s disease is they used to call it old timers. They used to joke and call it old timer’s disease and that’s really not the case anymore. We’re not talking anymore about people in their 80s and their 90s. Somebody in their 80s and 90s, you almost expect some degree of cognitive decline just as an aging process. I don’t think that’s abnormal to expect but now we’re talking about people in their 50s, people in their 60s. You can even see this working in much younger people in their 20s and 30s. How many people complain about brain fog? Brain fog, fuzzy thinking, are those the very, very early stages? Is that already a sign to people that your brain is not doing so well on a lot of carbohydrate? It could be. Leanne Vogel: Yeah, definitely. Let’s switch gears a little bit because a lot of people listening may not have Alzheimer’s or know anyone who has Alzheimer’s but they’re concerned about their overall brain health, more of a preventative measure. What test would you recommend where somebody is mentally when it comes to their brain health? Are there certain labs or cognitive tests that they can do to see how their brain is? Amy Berger: Yeah. There are some sort of diagnostic tests for Alzheimer’s that I don’t, you know, obviously, I wouldn’t recommend that for somebody who’s young and doesn’t really have any issues. I would keep more of an eye on the metabolic markers because those are going to go south, so to speak, long before you start having issues. They have done studies on people at risk for Alzheimer’s, whether it’s for a genetic reason or a family history. People at risk for this condition as young as their 30s and 40s, they can already detect the decline in the brain’s glucose metabolism. You do that via a PET scan, it’s like an advanced expensive test. People can get that done if they want to. They actually inject you with a form of glucose that they can measure how much the brain takes it up and they can already see that it’s decreased in certain people. That’s really not a standard test to have done and I don’t think it’s all that necessary. I think probably the single most important test anyone can have done, not just for Alzheimer’s, almost for any metabolic condition, anything having to do with insulin resistance is a fasting insulin test. If your fasting insulin is high, you already know something is out of whack and if your fasting insulin level is not high, there’s another more advanced test that you can test your insulin after eating. It’s like an oral glucose tolerance test except instead of only testing your blood glucose level, they test your insulin level. So it might be that your fasting level is normal but your insulin is going really high every time you eat and so it’s staying high most of the day but just by the time you wake up in the morning, it comes back to normal. I honestly think an insulin test is really one of the most important things. Then you can look at fasting glucose, you can look at A1C. The thing is though, we call this Type 3 Diabetes but you don’t have to be a Type 2 Diabetic to get Alzheimer’s. Not everyone with Alzheimer’s is Type 2 Diabetic, and I think it’s because everyone’s only ever looking at glucose. No one’s ever looking at insulin and I honestly truly think if we would add fasting insulin to routine blood work the way there’s glucose and there’s your blood pressure and your triglycerides. This is standard blood work that you get done in a normal checkup. If they would add insulin, it would be a total game changer. Leanne Vogel: That’s really interesting. Perhaps maybe somebody’s not able to afford blood testing and things like that. Are there certain maybe symptoms that people could watch for that maybe would trigger concern when it comes to brain health like perhaps brain fog or having a hard time remembering people’s names or just little things that you think, “Oh, I’ve just had a hard day,” or “I didn’t drink my coffee in the morning,” when really it’s actually something that you should probably look into? Amy Berger: Yeah, that’s a good question because I think it’s very subjective. Like I said, there are diagnostic tests that you can do that test cognitive function, but I think those are really done after someone is already suspecting that they have an issue. I think people know themselves. They know when something is worse than normal and worse than it’s been in the past. I think in the early stages, a lot of people report, like you said, whether it’s brain fog, not remembering things as easily, confusing words, using the wrong word for something or not remembering a word for something at all, pointing to something but not remembering what the name of it is, like any object, a computer, a spoon, a fork. You just forget the word. People that do a lot of math in their profession like an accountant or something like that, sometimes they report that they’re just not able to calculate as quickly in their head. So it’s subtle. It’s little things but I think … And we all have senior moments. Even a 20-year-old person will have a “senior moment” where you walk into a room and you forget why you went there. A little bit of that now and then is normal. We all get it. But when it does start becoming a problem and when it’s interfering with your work or even with your social life, I think it is subjective though which is unfortunate. But I think people know when something is getting a little more severe. I love being Canadian, the home of the true north, strong, and free. But gosh, I am jealous that y’all in the US get access to Thrive Market. For all my pals south of the border, my friends at Thrive Market are offering you 35% off your first box of groceries, plus free shipping and a 30-day trial. Imagine, spending only $9.95 as opposed to $20.99 on raw cacao powder, or $15.65 as opposed to $24.99 on MCT oil. On top of their everyday wholesale prices, the extra 35% off your first box of groceries plus free shipping is going to transform a regular, $100 grocery run into about a 50 to $75 Thrive Market order for the same amount of things. Go to thrivemarket.com/hp to get your instant 35% off. Available to new Thrive Market customers only. If you’re unsure of the link, simply check out the show notes of today’s episode to get all the details. What particular nutrients besides healthy fats, because keto equals healthy fats … well not always. Maybe we should actually talk about the dangers of the wrong fats on keto before we even get into particular nutrients because I know that I’ve seen multiple times and I’m sure you see this as well, people were like, “Yeah, yeah, I’m keto,” and you look at the types of fats they’re eating and you’re like, “No, you should probably change things.” So could we chat a little bit about unhealthy fats and their effect on brain health perhaps? Amy Berger: Sure. I think to be honest, eating a ketogenic diet with not so great fats is probably still better than not eating a ketogenic diet, specifically for this condition. I’m not saying everyone should go out there and eat whatever kind of fat they want. But I think the state of ketosis, however it’s achieved, is so therapeutic for this that somebody shouldn’t worry that much about the fats they’re eating at first. Over time, they might get more concerned about it and if they are concerned about it, of course, yes. I think obviously, the more stable fats we like, the less processing that has to be done to extract a fat and produce it, probably the better. We’re talking about the really good animal fats like tallow, lard, especially if you can get it from properly raised animals, grass-fed animals, pastured. If you can’t afford that, that’s okay. These fats are still okay for you. Regular supermarket bacon is still better than a jug of soybean oil. The fats that we would want to avoid are, like we mentioned earlier, mostly the vegetable oils, a big just of corn oil or soybean oil, cottonseed oil, all of these oils that are used in processed foods and they are actually fairly rancid. The technology required to extract all of this oil from these seeds and these grains is pretty intense and these oils are subjected to very high temperatures, very high pressures, and they’re very damaged by the time they’re even bottled, let alone when we bring them home and put them in a frying pan and then eat them. The reason this is a problem is the brain is literally built out of fat. It is largely built out of fat and cholesterol and if you don’t have the right building blocks, then literally your brain is not going to work properly. You’re going to have problems. If the fats and the cell membranes of these neurons are not constructed correctly, then it’s going to impact your cognition. Amy Berger: I should really quick though, because I think I only mentioned animal fats. It’s not just animal fats like coconut oil is fabulous for Alzheimer’s, of course, because the medium-chain triglycerides convert so easily to ketones which is great. But olive oil is fine, avocado oil, other fats like that that are more monounsaturated. Even all these healthy fats and foods like avocados and small amounts of nuts and seeds, these things are fine. What we want to avoid is going to the store and buying that gallon jug of clear “vegetable oil” and it’s all soybean. Leanne Vogel: Yeah, good point. Totally. Thank you for adding that. Now are there specific nutrients besides the healthy fats that we should be paying attention to when we’re eating a long-term ketogenic diet to prevent neurodegeneration? Amy Berger: Definitely, yeah. I think I mentioned B12. B12 is huge for healthy cognition. There’s something called myelin. If people are into health, they may have heard of myelin or the myelin sheath. It’s a fatty substance that protects neurons. It insulates them the way like these rubber wires insulate electrical cords. Myelin needs B12 to be synthesized and so B12, not just deficiency but even an insufficiency, can cause all kinds of neurological problems, not just cognitive impairment. Sometimes a B12 deficiency is misdiagnosed as MS or some like dyspraxia, like clumsiness. All types of weird things can come from B12 deficiency and B12 is very, very high in a lot of the foods that we’ve been told to avoid because they’re high in fat or cholesterol. Like for example, read meat, liver, shellfish, egg yolks, all these foods have a lot of B12 and these are precisely the foods our older folks have been warned against. Choline is another one. Choline is essential for a neurotransmitter called acetylcholine which is really helpful for learning and memory processing. And choline, the number one dietary source of choline is egg yolks. All of these egg white omelets and egg substitutes, they don’t have the kind of choline that real egg yolks do. And of course, the omega-3 fats. The brain, I just said, is largely built out of fat and cholesterol. I don’t know if it’s the predominant fat in the brain or not but in general, omega-3 especially DHA is so, so rich in the brain and DHA is in, of course, it’s in fatty seafood but it’s also in … It is in animal fat and it’ll be a little bit higher in the grass-fed and pastured meats. But again, we’ve been cautioned against the very foods that contain the nutrients we need most. Leanne Vogel: Yeah, definitely. When it comes to ketones and ketone range, what’s the best range to be in when treating Alzheimer’s or avoiding Alzheimer’s or is there a range for ketones? Because you mentioned, you don’t necessarily recommend exogenous ketones because they are short-lived and I agree with you. I think that they can be a good supplement if you’re already on a ketogenic diet and you need a boost. Do you find that there’s a specific special number when it comes to ketones and dementia and things? Amy Berger: Yeah. I’ll get to that in one sec. If I can real quick about the exogenous ketones, since you just mentioned it. Amy Berger: I think they have their time and place. I don’t think they’re a weight loss tool. I don’t think they’re going to help you manage your blood sugar much if you’re a Type 2 Diabetic. I do think they can be extremely helpful for people with Alzheimer’s especially if it’s somebody who is in a severe stage of this disease or the very elderly and you’re not going to get them to adopt the ketogenic diet. Let’s face it, somebody who’s 85 and has dementia is not going to give up their morning English muffin and jelly and orange juice for eggs cooked in coconut oil. So for those people, I absolutely think the exogenous ketones can be a godsend. But the exogenous ketones will do nothing to change the fundamental problem which I think the actual diet does. The diet does reduce the glucose load. It does reduce the insulin load. It’s anti-inflammatory. It does all these other things that the … All the exogenous ketones do is provide the neurons with fuel in the short term, which is great. I don’t want to discount the importance of that but they do nothing to address the underlying problem. Now with regard to the ketone levels, it’s hard to say because I think people respond differently. One person with dementia might have great results with ketones at 0.8 or 1.2. Someone else might not respond until their ketones are at 2.5. We’re talking blood levels of beta-hydroxybutyrate, for people listening. So I think it varies. I think you have to just experiment like if you’re going to help a loved one implement this diet, you just have to see. You have to see what happens. I don’t even think measuring is required. You can do it if you want but measuring the blood, it gets pretty expensive. It’s not cheap to measure blood ketones. You can measure the urine just to monitor compliance, just to see whether the person is actually in ketosis, especially during the first couple of weeks. Those urine strips are … I think they are pretty reliable, at least in the early stages of whether someone’s actually in ketosis or not. But I just think you’ll see the change. You’ll see whether the person’s behavior is changing, whether their cognition is better, whether they’re interacting a little differently with people. You’ll notice the difference. I think the benefit of measuring the ketones, if you can, is that you can then see is my husband’s cognition, is my wife or my grandmother’s cognition better when the ketone levels are at a certain threshold? Because otherwise, you’re just short of shooting in the dark. Leanne Vogel: Yes. I love everything you just said and I agree with you. Okay, so let’s chat a little bit about treatment measures and such. Do you need to be in a constant state of ketosis in order to cash in on the brain benefits or is low carb, high fat enough? I know that you mentioned the ketones being really beneficial when you have Alzheimer’s but if somebody’s eating low carb, high fat perhaps not testing and maybe they’re registering a little bit of ketones here, there, maybe they dip out of ketosis and they’re back in it. What are your thoughts on that? Amy Berger: Oh, I love talking about this topic. Thank you for asking, because I think that if somebody has dementia, if they are already in the disease process, it probably is helpful and important to stay in some degree of ketosis all the time. For people that are trying to prevent it, I think you said earlier, the type of diet or the type of intervention that we think would reverse a disease process is not necessarily required to prevent it from happening in the first place. I compare it to a bug bomb. If you have an insect infestation in your house, you might call the exterminator and they come and they set off a bug bomb, and that takes care of the problem. But that doesn’t mean you have to have an exterminator come set off this poisonous bomb in your house to prevent the infestation in the first place. You have much more low-level, simple interventions. You could not leave your food out, don’t leave the windows open. With regard to brain health, no, I don’t think ketosis is required at all times to prevent this from happening. I think if somebody enjoys a very strict ketogenic diet and wants to do it all the time, they can. I just don’t think they have to. I think low carb, high fat is probably a great way to go and really truly something more like Paleo that’s not even low carb by definition but is full of whole, unprocessed, healthy foods. The carbohydrates that are there are starchier vegetables, fruit. We’re not talking about Pop-Tarts and sugary breakfast cereal. I think for some people, that’s enough. I don’t think carbohydrate restriction per se is required. What is required is managing your blood glucose and insulin, keeping those things low. Some people can do that while eating upwards of a hundred to two hundred grams of carbohydrate a day, depending on how active they are, depending on other factors. As much as I love the ketogenic diet and realize the importance of low carb, high fat, I don’t think that we can discount just, I guess you would call it epidemiological evidence where you look at different populations around the world that age gracefully and with all their cognitive faculties intact. They’re not on ketogenic diets, whether you want to talk about the blue zones or whatever they call it. These people eat beans, they eat bread, they eat fruit. What they don’t eat is a lot of the modern junk that most Americas are frankly living on all day long. Yes, I think some amount of carbohydrate restriction is probably really helpful but people differ in the amount they have to restrict. I, too, agree with you that although a ketogenic diet is very, very, very, very healing and there’s a lot of benefits to it, if you’re working on more of a preventative measure and lifelong strategy, it’s beneficial to set it up as a lifelong strategy and not get too overwhelmed with all of the rules that come with this, standard ketogenic protocol because myself too, I know that when I first got started with keto and I went too strict, it was actually quite detrimental to my health because I was pushing myself too hard and forcing myself too fast and counting calories and macros and it just got a lot for me. So I’m happy that you mentioned creating that balance and support for your body overall. Amy Berger: Yeah. I think for people looking for prevention, I am speculating, we don’t have proof of this, but I would imagine that if your diet is good most of the time, and I can’t give numbers like I know people like Mark Sisson, he says 80/20. I can’t really give numbers. But if you eat well and eat relatively low carb most of the time, then once a month, every six or eight weeks, if you go to your favorite restaurant and go hog wild on nachos and beer or cheesecake, whatever the item is, that is not what is killing us. What’s killing us now is the constant influx. At breakfast, we have cereal and orange juice and toast with margarine. And then two hours later, we’re snacking on crackers. And then an hour later, we’re having a sandwich and chips for lunch. Three hours later, we’re having that afternoon slump at work and we have a granola bar. Then we’re home for dinner, we have pasta and bread sticks. It’s this endless onslaught all day long of sugar and starch. That, I think, is what’s doing this, in combination with rancid fats and not enough sleep and all the other factors. But I think really there is room for the occasional indulgence. I just don’t think, I don’t know. It’s not an either or like you were saying you had friends who said, “Oh, I tried the ketogenic diet but it was too much, and I just went back to my normal diet.” It’s not binary like you either eat ketogenic all the time or you eat garbage. There’s something in between that’s a healthy, wholesome diet. Leanne Vogel: Yes. I couldn’t agree with you more. Assuming many, many of the people listening right now are women, they are ketogenic. They probably don’t have Alzheimer’s, maybe they’re just concerned about their brain health and they’re thinking which is better. I know that we just finished the conversation on balance and eat intuitively to your ketogenic needs and go out to restaurants once a month or whatever you deem necessary. We chat a little bit about plant versus animal fat. I think you already answered this, but let’s just reiterate. Is there a better fat for brain health? Plant versus animal, are they just the same when it comes to brain health benefits? Amy Berger: That’s a good question. I’m not sure that I know a scientific answer. I think, like we said, coconut oil is just fabulous, fabulous for the brain but you can’t live on coconut oil alone. There’s other fats in the foods that we eat. I certainly think the stable animal fats are great. We have what they call the politically correct fats which is like salmon and avocado and olive oil. Even the people that used to fear fat like in the 1980s have come around to the fact those fats are okay. But there’s still this big stigma around animal fat, and there shouldn’t be. We don’t have time to get into this but it’s almost like a cultural problem that it’s unladylike to eat a steak or it’s unfeminine to eat a fatty pork chop. That kind of thinking has got to go, ladies. Don’t be afraid of red meat. Don’t be afraid of egg yolks. Don’t let anyone pressure you into getting that egg white omelet. I think animal fats are great for the brain. I have read that polyunsaturated fats, which is predominantly in some of the more plant oils except obviously coconut oil and is mostly saturated and olive oil is mostly monounsaturated. But something like flaxseed oil or some other polyunsaturated oil are more ketogenic. I haven’t really seen the signs on it, I haven’t looked at it. I don’t know if that’s true. So for someone specifically looking to get into a higher level of ketosis, those oils might be better? I’m just not sure. I think the animal fats are preferred, and then the plant oils that are mostly saturated and mono, so the coconut oil, the avocado, the olive oil. Leanne Vogel: Awesome. Cool. Is there something else, assuming that a lot of the people listening are ketogenic, other than the fat intake, we chatted about stress and sleep quality, physical activity, avoiding vegetable oils. Is there anything else that the ketogenic woman could do on a daily basis or monthly basis to ensure proper brain health? Amy Berger: I want to emphasize the sleep because sleep is so important for brain health. There’s a reason you don’t feel so well when you’re just not getting enough sleep. It’s especially important for Alzheimer’s because when we sleep, some of the toxins that, I hate that word, that’s such a charged word, but some of the metabolic waste products that build up in the brain are more effectively cleared while we sleep than we’re when awake. So if you’re “supposed to be asleep” for like eight hours, six to eight hours and you’re only sleeping five hours, your brain doesn’t have as much opportunity to clear these metabolic wastes. There’s other reasons why sleep affects Alzheimer’s too, but that’s one of the big ones, that some of these toxic buildup products are more effectively swept away when we sleep. For the ketogenic people specifically, and the ketogenic women maybe more so than the men, don’t be afraid of protein. Unfortunately, the ketogenic world, we sort of scared people away from consuming even adequate protein because everybody is so concerned about reaching a certain level of ketosis. Or they build their diets around ratios, 80% fat, 10% protein, 10% carbs or 5% carbs, and I honestly think there’s a lot of women in the ketogenic space undereating protein. The protein, it’s not as important for the sake of the cognitive function and brain health but for your overall health, and even for insulin sensitivity. You can’t build muscle without eating adequate protein and you can’t hang on to your muscle without adequate protein. Having muscle mass on you and using it is a really, really great way to stay insulin sensitive. Leanne Vogel: Yes. Oh, my gosh. You are the first guest I’ve had on the show so far where I’m like yes to the protein conversation because I can’t tell you how many people I meet and they’re like, “Yeah, well ketogenic diet is low protein.” I’m like, “Blah.” Or the whole gluconeogenic conversation and although yes, totally, if you eat oodles of protein, you’ll probably need to be concerned with your protein intake and glucose regulation, but we’re talking a lot, a lot. This is a demand-driven state. It’s not something like oh, all of a sudden, the burger that you ate turns into glucose and now you’re not in ketosis anymore. So I think there’s a lot of fearmongering in the ketogenic space about protein and yes, I agree with you. Amy Berger: Yeah. Thank you. There is a ton of fearmongering. I wrote a super long blog post about this. Maybe we can put it in the show notes or something. I wrote a blog post explaining gluconeogenesis to try to inject some calmness into this because I do get a lot of women who have built their diet around those ratios. And when it comes to protein, the absolute amount of protein, the absolute number of grams is way more important than the ratio because I get women that are eating 50 grams of protein a day and that is simply not enough. We can just frame this by saying the type of diet and the macronutrient breakdown of the diet is different depending on what the goal is. If somebody has epilepsy, if somebody has cancer, if somebody has Alzheimer’s or Parkinson’s, it’s very different from someone who’s healthy and wants to stay healthy and it’s very different from someone who’s goal is fat loss. They can both be low carb, they can both be ketogenic, but it’s a different numbers game. Leanne Vogel: Yes, amazing. Okay last question, getting into a little bit more of the science behind things. What are the options for somebody with existing genetic predisposition for Alzheimer’s, specifically if they have the ApoE4 genes? Conflicting dietary recommendations for somebody who is at risk for Alzheimer’s versus diagnosed with Alzheimer’s. So if you have a genetic predisposition, rather, for Alzheimer’s, is there something else you need to be doing? I know that I have this as well. What should one do if their gene say you might get Alzheimer’s? Amy Berger: I think you, Leanne, are probably already doing everything I would recommend to do which the number one thing would be a low carb diet. That APOE4 gene is right now the number one most powerful genetic risk factor we know of for this condition, but it’s not a death sentence, it doesn’t cause Alzheimer’s disease. It makes you more susceptible, it’s a risk factor, but not everybody who has two copies of this gene develops Alzheimer’s and many, many people with Alzheimer’s do not carry even one copy of this gene. So it really doesn’t cause Alzheimer’s but yes, it does make you more at risk. I think there’s some speculation about this gene. This gene seems to have been formed or forged, sort of, among hunter-gatherer peoples and it was selected against in populations that have a longer history of a grain-based agriculture. It’s very low in like East Asia, Southern Europe, Central America, so places where they were eating rice and wheat and corn respectively have a much lower incidence of this gene. What that means is the people that have this gene are the least suited for a diet that’s high in grain. I can’t say high in total carbohydrate but high in grain and sugar most likely. I think the number one thing for the E4s is a low-carb diet. Some people speculate about dairy for them like again, because this is an older genotype, so to speak, they really don’t do well with dairy. I guess a lot of the E4s find that if they eat a lot of saturated fat, their lipids go crazy, the cholesterol goes crazy, everything goes crazy, and they have a much higher risk for cardiovascular disease. I think the jury’s out on that because having a high cholesterol by itself is really not indicative of heart health, so it’s hard to say. I think the number one thing they can do is a low carb diet and maybe other things to help insulin sensitivity, but that’s really not any different from what I would recommend for anyone else. Some of the E4s, they do prefer to go much lower in saturated fat and much higher in omega-3. They would get most of their protein from seafood rather than even from pastured, good ruminant animal. Leanne Vogel: Yeah. I’m really happy that you mentioned the cholesterol piece because as somebody who has this predisposition and who test their blood like crazy, I find that actually when my cholesterol is higher, I’m very in tuned with my body. I find that when my cholesterol is higher, my brain feels better. I don’t know how else to explain it other than I do have those problems where I look at an item and I can’t remember the name of it or I use wrong words in wrong places and I find that when my cholesterol is higher and I’m eating more saturated fat, those instances go away or reduce quite significantly. That’s really interesting to me that you mentioned that. But yeah, I agree with you on all those fronts and it’s just something that you need to be mindful of and I think it’s also some people don’t like to test for those things because they think it’s a death sentence. But I just like to know, so I can bend and flex now as supposed to dealing with the hot mess later, so yeah. Amy Berger: Right. But that’s really cool that you’ve made that connection that you find when your cholesterol is higher, you feel better because people really are terrified of cholesterol. That’s a whole other topic but people get really, really scared. We can’t emphasize it enough. A high cholesterol by itself tells you absolutely nothing about the health of your heart or your blood vessels, absolutely nothing. Leanne Vogel: Agreed. Where can people find you if they want to learn more about all the things you’re up to? Amy Berger: My website is Tuit Nutrition, it’s T-U-I-T Nutrition.com. I’m very active on Twitter. My handle is TuitNutrition. I’m based out of the Northern Virginia area, near DC, but I do work with clients all over the place on the phone and Skype. Leanne Vogel: Amazing. Well, thanks so much for coming on the show, Amy. I think we could’ve talked for a billion hours about this kind of stuff. I really like it. Thanks for doing the work that you do out in the world. We all really appreciate it. Amy Berger: I could say the same to you, Leanne. Thank you. Leanne Vogel: Amazing. The show notes and full transcript for today’s episode can be found at healthfulpursuit.com/podcast/e52. That does it for another episode of The Keto Diet Podcast. Thanks for listening in. You can follow me on Instagram by searching Healthful Pursuit, where you’ll find daily keto eats and other fun things. And check out all of my keto supportive programs, bundles, guides, and other cool things over at HealthfulPursuit.com/shop, and I’ll see you next Sunday. Bye.